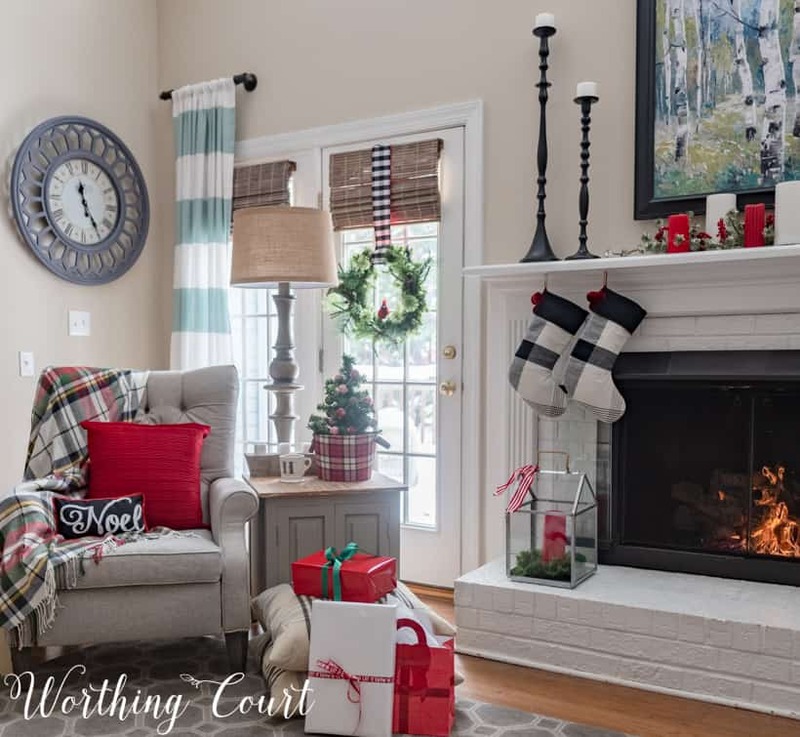 You’ll find lots of easy to copy ideas for your home when you tour this family room decorated with an updated traditional style for Christmas. 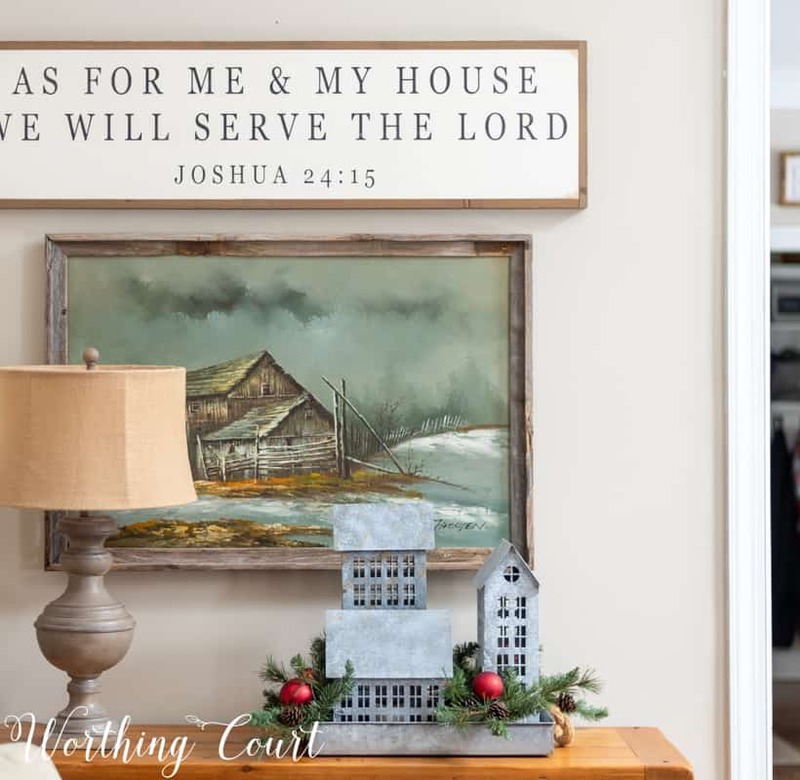 They say that the kitchen is the heart of the home, and mine usually is, but that role switches to my family room during the Christmas season. My family room is where everyone gathers to drink hot cocoa by the fire while watching a Christmas movie. It’s the place where we enjoy one another’s company in front of the tree and where so many new family memories are made! Yes, of course our kitchen gets used a lot, but it truly takes second place during the holidays. There’s just something magical about the Christmas tree and a having a fire in the fireplace that seems to draw everyone to this space. 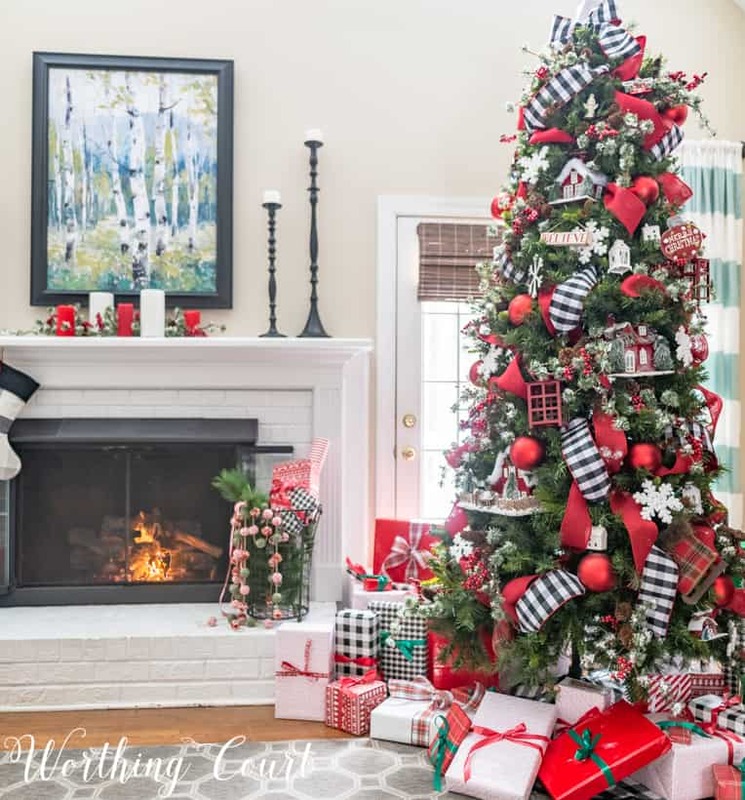 This year, my tree is filled with red and white decorations and with gorgeous silk black and white buffalo plaid ribbon added to it. I did a little experiment with my 9′ tree this year and it’s all because of how I was influenced by the time I spent with a few professional designers learning their step-by-step secrets for decorating a Christmas tree. You can watch the video and see the entire process of how they decorate a Christmas tree by clicking HERE. I found the cutest, glittery red houses and a barn on clearance after Christmas last year and have been waiting all year long to use them. As soon as I put my tree up, I knew exactly where they would go! The first thing that I added to the tree was the ribbon, but the houses were the very next thing that I added and I love how quaint and cozy they look nestled into the branches! 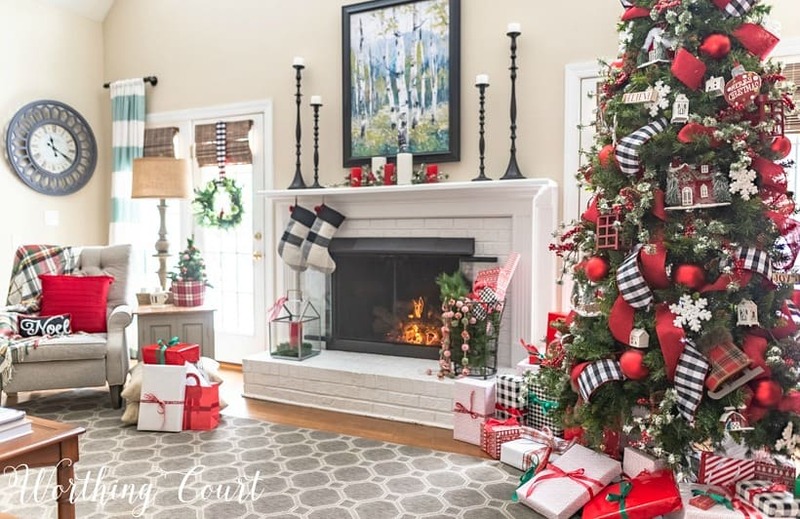 After the houses came the largest ornaments, then the medium and smaller ornaments and then the picks of faux snow covered greenery and red berries. I did a video tutorial of how I add ribbon to the tree that you can find by clicking the ‘Christmas Inspo’ button in my Instagram profile. 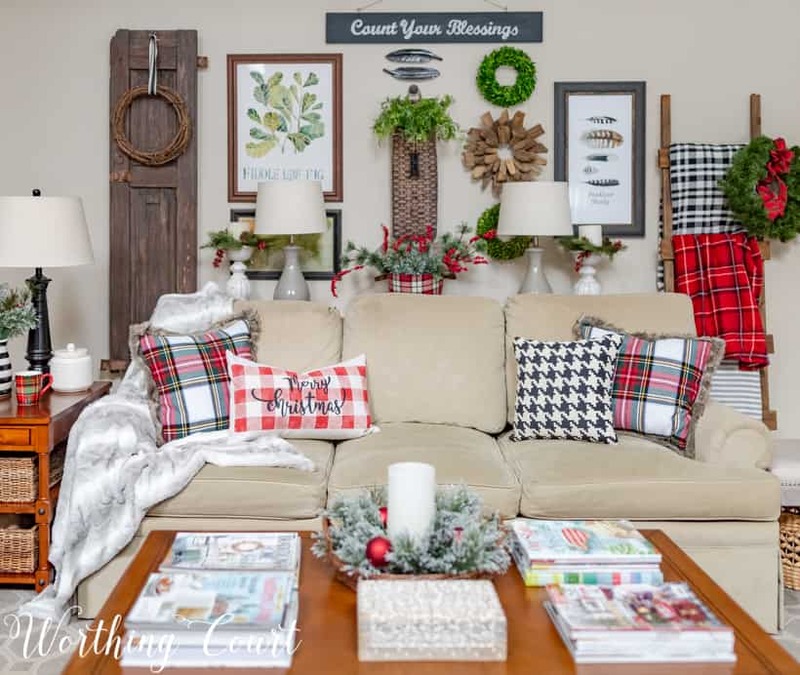 The opposite side of the room is where my sofa is located, which I cozied up with a furry blanket and fur trimmed plaid Christmas pillows. 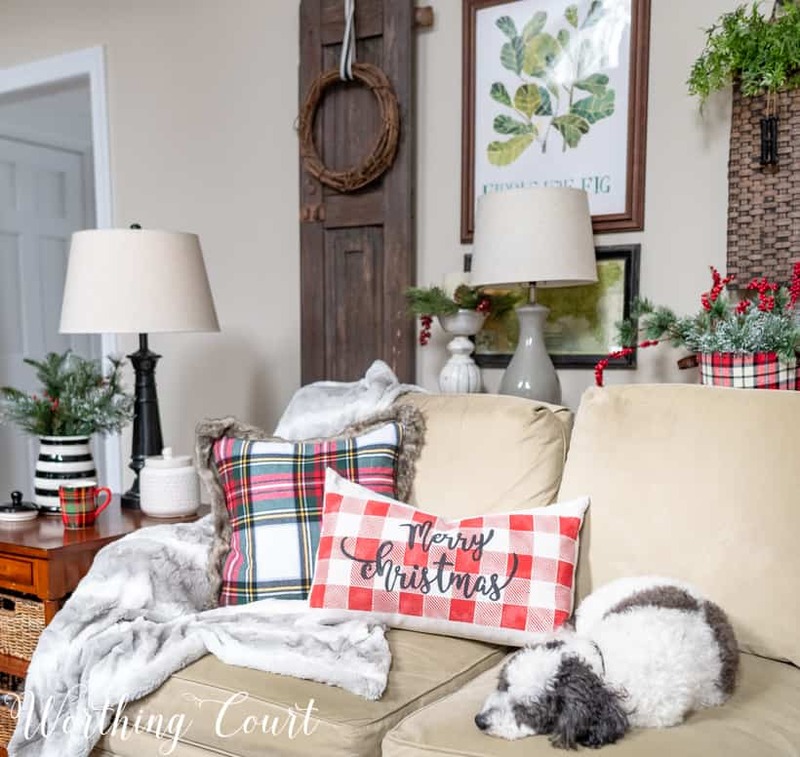 On my diy sofa table, located behind the sofa, I added two chunky white candlesticks and a cute flannel plaid covered basket filled with artificial greenery. 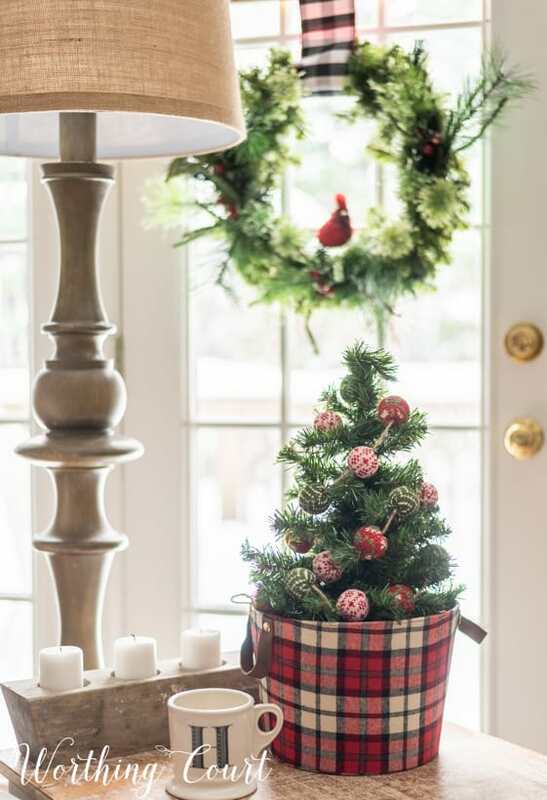 Very simple and very easy – that’s my favorite way to decorate! It’s easy to see exactly who in the family thinks that this is his cozy spot! On the console table at the end of the sofa, I placed a simple arrangement of galvanized metal houses in a tray, added a few sprigs of artificial greenery and tucked in a few frosted red ornaments. 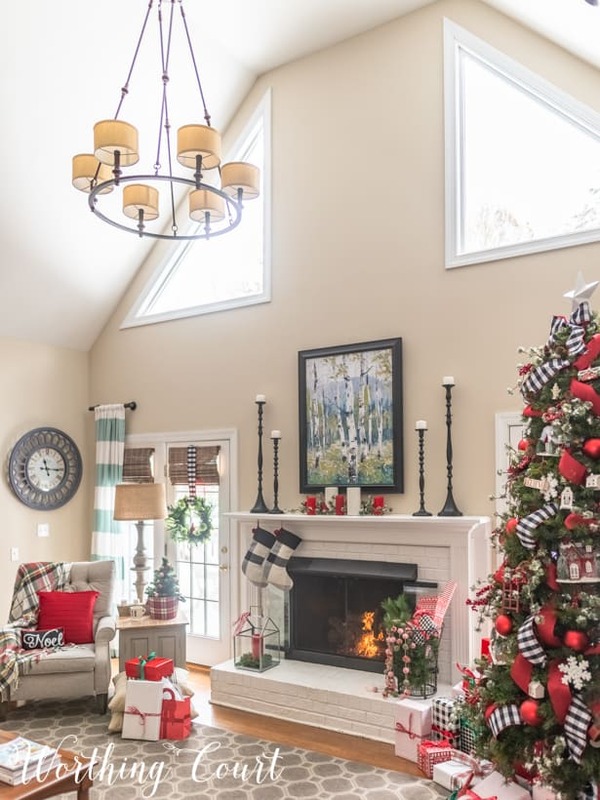 It’s little touches like that and the pair of red lanterns on the bottom of the table that help to carry the festive red throughout the entire room without being overwhelming. If you’ve been following me any time at all, then you already know that I’ve been working on my husband for a long time to get him to agree to replace his worn (not in a good way) leather recliner and he finally did! My husband is 6’2″, so on top of comfort being a priority, the chair also needed to support his neck and shoulders. For me, I simply wanted it to be pretty! 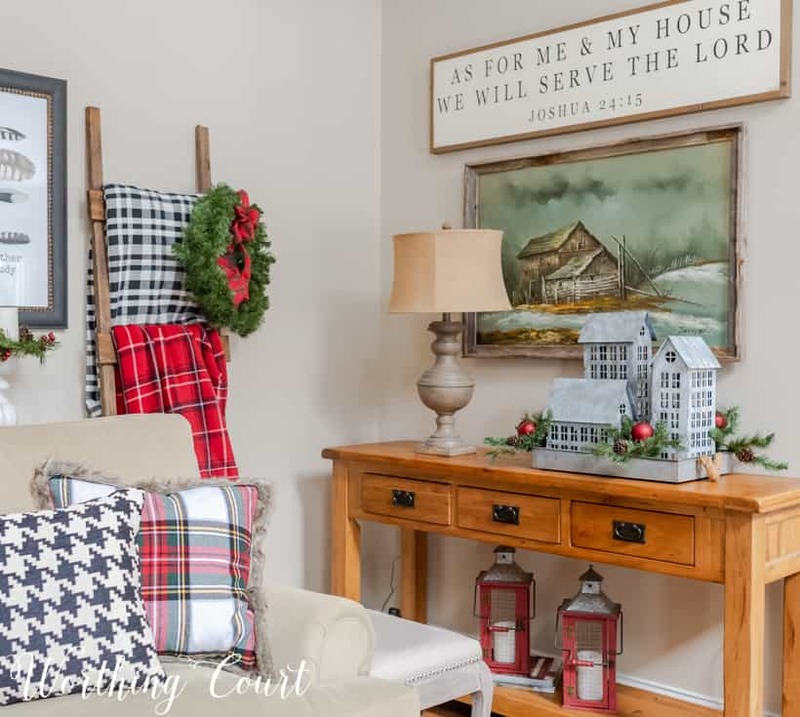 Hanging a wreath on the French door behind the chair and adding another flannel plaid bucket filled with a mini tree makes this quite the cozy corner now. And of course, I’m so glad that the poofy leather chair is gone! I have a lot of changes planned for this room starting after the New Year and can’t wait to bring you along on the journey! I am in the process of moving after the sudden death of my husband and will be living near my kids and grandchildren in NH. I am so excited that I found your blog and can’t wait to really delve into it. I love your ideas, your home and the fact that you love Jesus. Without Him, I would be a total mess right now. On to the life of widow but bringing all the memories of him with me, and decorating my condo! I am in love with your blog! Merry Christmas. I am so sorry to hear about the death of your husband. We don’t know one another, but as a believer myself, I am glad you have the hope of heaven and His special comfort that nothing in the world can give. Glad you found Suzy’s blog to be helpful as you make your new house into a home! Hi Sharon. I’m so, so sorry for the loss of your husband, but am glad that you have many wonderful memories to carry with you. I love your testimony about leaning on Jesus! I would be an absolute mess every single day without him. A very merry and blessed Christmas to you and yours! 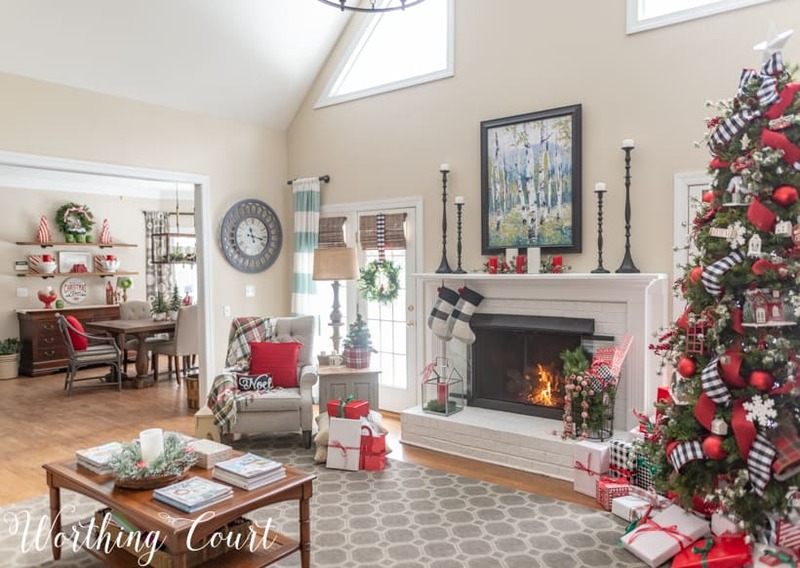 Suzy, I love your updated traditional family room! It is a breath of fresh air after the endless parade of farmhouse decor that pervades the blogosphere. Only a few forward-thinkers are starting to phase out the farmhouse look. I enjoy both your blog and your Instagram. Thank you so much, Janet! All decorating styles come and go (only to be repeated 20 years later – lol), so I think it’s time to start moving on a bit. I stayed in the red, gold and green Tuscan cycle way too long and don’t want that to happen again! Merry Christmas and a happy new year to you and your family. May the blessings of Christmas be with you through out the year. Thank you so much! I’m all about not busting the proverbial bank when I decorate! 😀 Merry Christmas and Happy New Year to you and your family as well! I would love to know where you found your “man” chair! I’m having new couches delivered next week and would love to get rid of the “antique” Lazy-Boy. I’d have to do some heavy convincing but think I could persuade if I found something comfy but stylish. I’m tired of seeing the cat scratches on a chair that’s so old the cat’s been gone about 15 years!!! Thanks and absolutely love your blog! Hi Vicki. Here’s the link to our exact chair: https://www.havertys.com/webapp/wcs/stores/servlet/ProductDisplay?item=13322-266&langId=-1&storeId=10001&catalogId=10051 . It can be upholstered in several different fabrics – we chose: 100208-90 Dove, Finish Color: Patina, in case you’re interested. I have a tall husband too and need a new recliner with the same needs. Can you share your source? 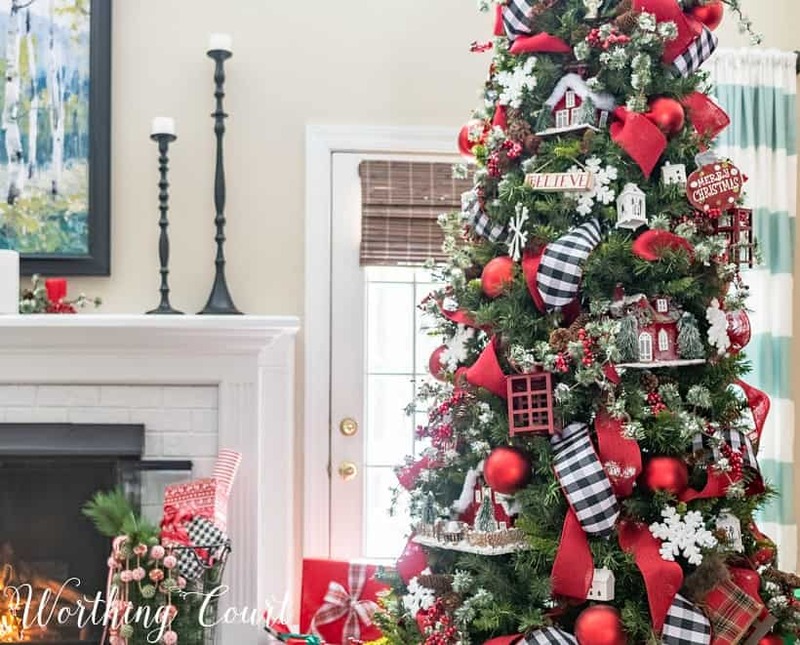 I LOVE the red and black and your tree is darling! So fun! Love your style. So glad you like my tree! Here’s the link to our exact chair: https://www.havertys.com/webapp/wcs/stores/servlet/ProductDisplay?item=13322-266&langId=-1&storeId=10001&catalogId=10051 . It can be upholstered in several different fabrics – we chose: 100208-90 Dove, Finish Color: Patina, in case you’re interested. I loved your tree and the traditional style decor! It’s all very well done. Thanks for sharing with us! Have a great day! Thank you so much and Merry Christmas, Shelia! Thank you so much! Merry Christmas to you as well! !